John Esson was born the son of Robert and Jane (Jean) Reid on 28th July 1784 at the small farm of Balnacraig in Aboyne parish. He was the couple’s second son. He would have attended the local school, and may well have gone to Aberdeen Grammar school, although we have no record of that,. A note his brother Robert placed alongside his parents will gives us to believe his own education had not been cheap, and their brother Henry went to Aberdeen Grammar School and then Marischall College in his education. 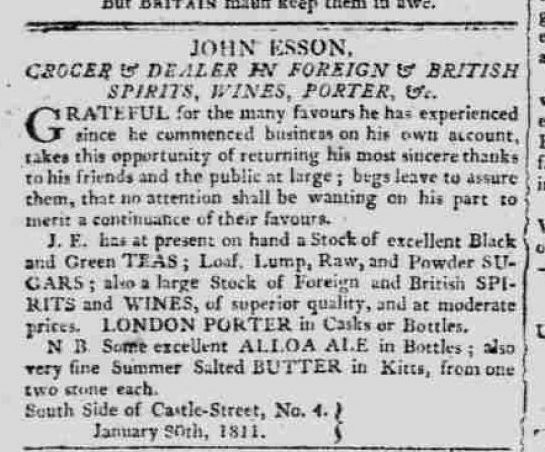 In all likelihood John started as an apprentice with a merchant when he left school at 14, as in 1811 an ad he placed in the Aberdeen Journal thanked people for their help since he had gone into business on his own, and at that stage he would have been just 17. It was in that way his career as a as a merchant and ultimately an importer and exporter began. He had a shop at 4, Castle Street Aberdeen, where he sold wine an spirits as we see. He clearly had help to achieve that. In 1814 he was able to take on two apprentices, a William Corbett and William Esson, almost certainly his nephew the son of William of Melgum. In business and the professions in those days it was helpful if not essential to have an established sponsor and mentor. John married Frances Auldjo in 1817. Frances was the daughter of the former Provost of Aberdeen, George Auldjo of Portlethen, and Susan Beauvais, the daughter of Louis Beauvais, a wine merchant of Quebec. George Auldjo had passed on in 1802, but his brother Alexander Auldjo showed a strong interest in the family, appearing at Frances and John’s wedding, for example. There he was recorded as a member of the Honourable East India Company. Alexander had just returned from Montreal, where he had worked since 1778. He had made money in the early highly lucrative days of fur trading, and in the import and export of food, wine and general goods. He also had interests in broader commerce with interests in the UK based Phoenix Life Assurance and other similar companies, and he was a major investor in Montreal First Bank. No doubt he would have been helped by Louis Beauvais in all of this. Louis was a successful business wine dealer, the father of George Auldjo’s wife, Susan Beauvais. He had considerable status in Montreal and Canadian Society and no doubt acted as a patron to help John. Frances’s brother, also named George was a trader too, and a person of note in Montreal Society. These contacts, directly and indirectly benefited not only John, but also Henry Esson, and William Esson, John’s cousins, and Alexander Gale their nephew. Henry secured a place as a minister in the Presbyterian Church in Montreal, as did Alexander Gale. William like John before him became a successful wine dealer. John and Frances had a child named George Auldjo in 1844. He, like John, went to University and did very well. He became a chartered accountant, and married Margaret Skene on 5th February 1844 in Old Machar, Aberdeen. Margaret was the daughter of a retired Captain in “Her Majesties land forces”, Alexander Skene of Louisville, Kentucky. The Skene family were a notable family, with many eminent people amongst them. George and Margaret lived in Edinburgh where their three children, George Auldjo Esson junior, Alexander and Susan were born. The family prospered and George Auldjo junior became a highly respected accountant viewed still today as “the founder of modern public accounting”. George Auldjo junior obviously did not accompany John and Frances to Canada when they emigrated in 1817. Robert, born in 1815 did however, for obvious reasons. John and Frances were in Lucker in Quebec in October 1818 when Susan was born. They had two more children, Frances was born in 1820, and Christina Brown was born on 18th August 1822 and christened the day after. There is no doubt John was successful in his business over a number of years, a lot to do no doubt with business, and we also see occasions when he made the arduous journey back to and from Scotland. A striking thing about these records is that a reasonable number of Essons appear, and the Gale family too, but most if not, all seem to be relatives of John and Henry, and Alexander Gale. 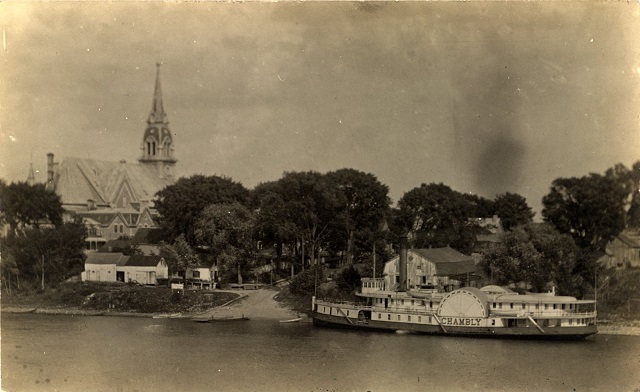 Perhaps they were there in the earlier days of immigration, or perhaps, more likely they had occasion and opportunity to travel up and down river more often. Sadly, like his brother Henry John and Frances had tragedy when their daughter Susan died in 1820 at the age of 5. Disease was common at times in the colonies, and with little treatment to hand but quarantine and fumigation child mortality was high. The Hudson Bay company gained supremacy in trading and the trading company Auldjo, Maitland and Gardner became bankrupt. George Auldjo was hit badly, and Alexander Auldjo was affected by sever losses from involvement in insurance after a great fire. It seems very possible John was affected by similar things. Having said that we know that John’s son Robert prospered. Robert married Jane Ann Stoughton on 15th August 1844. John died while staying at Napanee with Robert in August 1847. Robert was a farmer in Fredericksburg in 1851, according to the census that year. His sister, aged 28 seems to be staying with the family. In 1871 he was at Napanee, where he stayed the rest of his life. We see they had 5 children with them that year, Mary, Louis Auldjo, Margaret C (sic), Helen and Elizabeth McCauley.We know more about this family thanks to the website BrushedbyMystery.com produced today by Helen’s great granddaughter. This site has a picture of Helen and her two children in 1899 and a good deal more information about Helen and Alwyn, their children and Robert Esson and Jane Ann Stoughton. In a letter from Jane Ann Stougton to her sisters, she mentions that Robert is standing for election. We know from documents that Robert was indeed elected in Napanee and he became the Town Treasurer. Another article describes the author learning that Robert, Anna (I guess) and sister Christina, are buried, at Riverside Cemetery in Napanee in a somewhat unmarked place. Again, sadly Elizabeth McCauley died in childhood aged 9. Helen however married Alwyn Gamsby in 1884, They had two children, Marjory in around 1897, and Guy around 1896.